Some people's ill-spent youths involved wild parties, illicit substances, general rabble-rousing and carousing. Mine was more in the line of spending too much time listening to cast albums and watching science fiction television programs, but hey, to each his own. Give me a musical like Camelot that combined a musical theatre pedigree even my self-taught eyes knew to be renowned with a subject matter that I adored (why yes, I did own a coffee table hardback encyclopedia of Arthurian legends that I ordered from the Science Fiction Book Club, thank you for asking), and it was bound to be beloved by yours truly. I borrowed the cast album again and again from the library, I retained a stubborn fondness for Richard Harris and Vanessa Redgrave in the film version even when I read that they weren't supposed to be very good, and I copied out Arthur's soliloquies into my personal commonplace book. 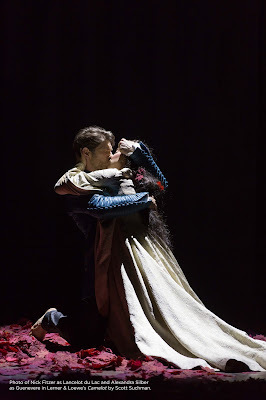 When you love something so fiercely with imperfect knowledge of how it actually works on stage and how it might measure up to eyes that are more jaded in 2018 than they were back in the mid-nineties, it can be more than a little nerve wracking to take your seat in Sidney Harmon Hall for the Shakespeare Theatre Company's production of Camelot, even knowing that Alan Paul has done you right for several seasons' worth of classic musicals at STC. Walt Spangler's minimal, warm wooden set doesn't give much away, and while the production photos make great promises for Ana Kuzmanic's costumes and Robert Weirzel's lighting design, you still don't know. Ken Clark's Arthur first enters the stage on the eve of his final battle, heartsick and weary and you may worry that you've misremembered everything and are in for an evening of discontent and disillusion that mimics the despair that's been plaguing many of us for the last 568 days or so. Luckily, we don't have to wait long to be proved joyously incorrect--as he launches into "I Wonder What the King Is Doing Tonight," Clark brings wit, vivacity, and boyish appeal center stage that tempers over the course of the evening into intelligence and conviction. Alexandra Silber rushes on shortly thereafter with an accent like a Dowager Duchess and an undeniable charm in "The Simple Joys of Maidenhood." 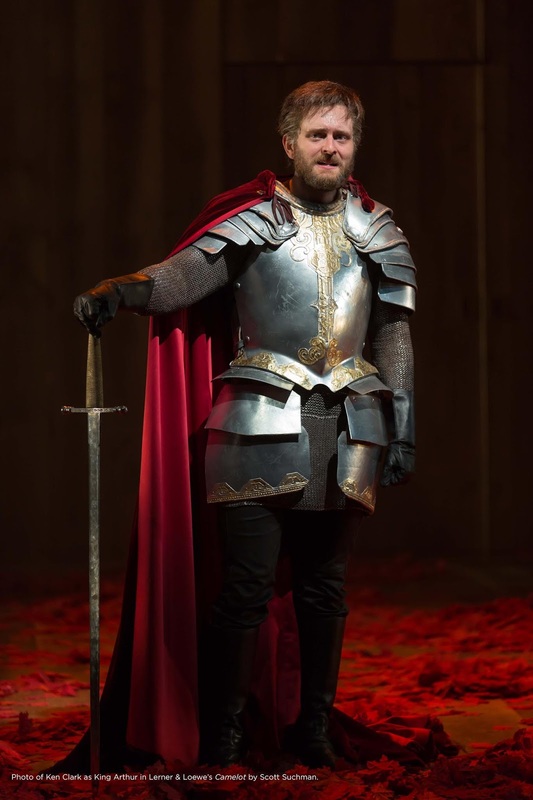 By the midpoint of the first act, we likewise meet Nick Fitzer's Lancelot, who bursts onstage with "C'est Moi" and manages to find comic gold not just in the good-natured egotism of the song's self-satisfied lyrics, but makes a feast with the simple repetition of "Camelot! Camelot!" Alan Jay Lerner's book shows us a king forging a new path toward decency and justice, wrestling the worser angels of his kingdom before finally discovering them in his own heart and within the two people he loves best in all the world. Clark's boyishness evolves into complex and compelling goodness, just as Silber and Fitzer bring both joy and the agony of betrayal into their love story, with Fitzer's voice almost overwhelmingly gorgeous in his rendition of "If Ever I Would Leave You." In the second act, Spangler's set brings in a carpet of autumnal leaves, menacing in their bloodred foreshadowing of the fading of Camelot's glory. The heart of Camelot the musical lies in how much we the audience can care about these characters out of legend who we know are doomed from the moment the house lights dim. Paul's production shows us their human hearts, the vulnerability of a joke or a promise, and the terrible pain of trying to find a path between our ideals and our faults. And in 2018, in Washington DC, we can see even more in this Camelot. We've already been reminded every day of the ways in which our fellow citizens fall short in enacting basic human decency towards each other, and Arthur's heartbreak at the fall of his kingdom of (dare I say) hope and change echoes in our time. But Paul's production has a secret strength in the casting of one Trinity Sky Deabreu, who appears late in the play. Deabreu's presence is incandescent, brimming with charisma and bringing me to tears. A year and a half ago, I wrote about the impact of one moment in STC's The Secret Garden and how it broke and rebuilt something in me during a single song. The glory of a classical theatre is that it brings audiences repertory that can have this effect across decades and centuries, all under one roof. That ending spoke to audiences one way in 1960, it spoke to the Kennedys and a nation in mourning in 1963, and it speaks to us here again in DC in 2018. When I was a teenager, the finale moved me as a story of what was lost; this time, I saw a glimmer of what we might some day gain. Camelot was never a perfect show, but it doesn't have to be. It can still hold a mirror up to nature and show us ourselves, reaching towards creating something better for our fellow human beings, and knowing that even when we fall short, someone else can carry on the story and keep striving.